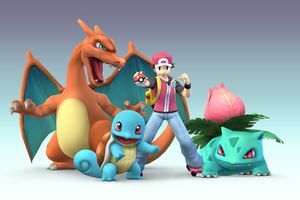 Pokemon Trainer is one of the most unique characters, having access to three fighters in one. 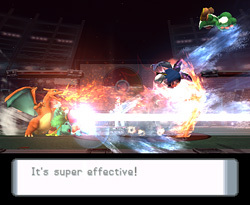 However, to prevent players from sticking to only one Pokémon, the developers introduced a stamina mechanic. This means the player must switch Pokemon from time to time. So to play Pokemon Trainer effectively, you must use not one but three different playstyles during a single match. Pokémon have a special property called stamina. Pokémon start out with 120 stamina points. 1 stamina point is used per second and each attack also uses 1 stamina point. Pokémon with 0 stamina have less power and droop in their standing animation. Pokémon that you are not currently using recover 2 stamina points per second. All changes last as long as it takes for the game to load the character. Pausing may speed up the change. After you change, you are wide open for attack. Dying will automatically change Pokémon. Another mechanic of the Pokemon Trainer is type effectiveness. Getting hit by a move that is super effective will deal 10% more damage and knockback while getting hit by a move that isn't very effective deals 10% less damage and knockback. Squirtle is weak to Grass while resists Fire, Ivysaur is weak to Fire while resists Water and Charizard is weak to water while resists Grass. However, the Pokemon does not resists themselves (Charizard doesn't resists Fire etc. ), and it only applies to those three types (Squirtle isn't weak to Electric attacks). The trick to mastering the Pokémon Trainer is knowing when to switch Pokémon. When you are desperate for a KO, or your chance of being KOd is a little close for comfort, change to Charizard for an Offensive and defensive boost. You lose speed when you do but you get a triple jump as opposed to a double because Squirtle and Ivysaur's third jumps aren't all that reliable to escape from a dangerous situation. When your opponent's damage is low, switch to Squirtle to slowly build up damage. When their damage is getting higher, switch to Ivysaur for a slight damage boost and to relieve Squirtle's exhaustion. When their damage is soaring; switch to Charizard to finish them off. Finally, if time is running low and you think you can just squeeze in one last KO, switch to Charizard to try and land a good smash attack. However, Ivysaur's Up Smash attack will finish almost any character off, but it takes a while to execute. Highlight the Pokémon Trainer on the character-selection screen and tap in any direction in any direction. Select the Pokémon Trainer, and his and all the Pokémon's portraits appear at the bottom of the screen. The Trainer's portrait will be glowing. Click on one of the Pokémon's portrait with , and it will start glowing instead of the Trainer's. Also, the Trainer's name will be replaced with the chosen Pokémon's. If the Trainer himself is selected, the Pokémon you start with will be randomly decided. Squirtle is a middleweight character with incredible speed. Although its special attacks don't really stand out, most of its other moves are very useful. The Down smash shouldn't be used so much because Squirtle's Up smash is just better, and covers both sides. Squirtle also has a fast turnaround animation which you can use repeatedly to confuse your opponents. Squirtle is least affected by type effectiveness as only Ivysaur has Grass attacks and a majority of the cast uses Fire attacks. However, it is most affected by the Stamina stat as its KOers get weak as it tires. Turtle Combo Squirtle punches, then hits with its tail twice. Very fast. + + + + Tail Swipe Squirtle swipes its tail forwards. + + + + Turtle Thrust Thrusts itself upwards. + + + + Tail Swat Squirtle crouches down low and swipes with its tail. while dashing while dashing while dashing while dashing Shell Bash Throws itself forwards, shell first. Smash + + + (Smash + ) or (Smash + ) or Shell Smash It rears back then charges forward in his shell. This can be used to protect your self from flying if timed correctly. Smash + + + (Smash + ) or (Smash + ) or Water Pillar It shoots water from the ground around him. Smash + + + (Smash + ) or (Smash + ) or Shell Spin It spins around in his shell. after grab after grab after grab after grab Headbutts Squirtle headbutts its opponent. after grab after grab after grab after grab Frontal Kick Squitle kicks its opponent away. after grab after grab after grab after grab Back Kick Squirtle kicks its opponent behind itself. after grab after grab after grab after grab High Tackle Throws its opponents upwards then hits them with its shell. after grab after grab after grab after grab Ground Slam Throws its opponent on the ground and slams him. Withdrawn Spin Spins in its shell. + + + + Turtle Kick Kicks in front of him. + + + + Turtle Tail Thrusts its tail behind it. + + + + Tail Flip Squirtle flips its tail above him. + + + + Squirtle Tornado Spins around, hitting multiple times. Water Gun Squirtle begins charging Water Gun. Press the button again to fire. While firing, you can aim up and down. Squirtle can cancel charging at any time by shielding or by moving. The water gun deals no damage, but has large knockback. Useful to mess up opponent recovery and to buy time to change Pokémon. If you fire Water Gun a second after pressing the button, at close range it can deal a small amount of damage. + + + + Withdraw Squirtle retreats into his shell and starts moving fast across the stage. Deals little damage, but you are nearly immune to attacks while in the shell. Be careful not to fall off the stage. Also, if an enemy jumps directly on your back, they will knock you on your shell and you will be unable to move for a second or two. + + + + Waterfall Squirtle rides a wave upwards. Deals good damage if it connects, but unless you hit the enemy with the final hit you will be open for the enemy to attack you. When recovering with this move, aim for the ledge or risk being hit again. + + + + Pokemon Change Changes to Ivysaur. It does a backflip and says "Squirtle Squirtle!" + ( or )+ or or It spins around on his tail. + It withdraws into its shell and spins around. Ivysaur is a middleweight with average speed. It's there to out-range its opponents with projectiles and high ranged and at the same time quick attacks. Despite its position in the Pokémon swap order, Ivysaur actually has more knockout power than Charizard. Ivysaur has a mix of quick attacks which do little damage and slow attacks with incredible knockback. Because of the slowness of its knockout moves, Charizard usually still remains the best choice for knockout attempts. Ivysaur is also a good projectile spammer. Its up smash has incredible power behind it and can get KOs if hit. His back and front aerials also have a lot of range to them, and its up and down airs are very strong.Ivysaur's rapid Bullet Seed attack can easily damage flight characters like Pit and Meta Knight, and stop other characters using their down smash on it if used properly. Despite its many advantages, Ivysaur has mediocre recovery, having average jumps and a tether for its up special. Vine Combo Whips with its vines two times then whips multiple times. + + + + Leaf Blade Spins its leaf around it like a helicopter. + + + + Vine Thrust Thrusts itself upwards while supporting itself on its vines. + + + + Low Vines Whips its vines twice near the ground. while dashing while dashing while dashing while dashing Body Slam Slams itself into the opponent. Great knockback. Smash + + + (Smash + ) or (Smash + ) or Vine Ram It stands on its two vines then rushes forward by springing itself with its vines. Smash + + + (Smash + ) or (Smash + ) or Vine Spin It holds its vines up then spins them around itself. This move is weak for a smash attack, use it only to knock enemies away. Ivysaur grabs with its vines. It is one of the least laggy tether grabs in the game. after grab after grab after grab after grab Constrict Squeezes opponent with its vines. after grab after grab after grab after grab Vine Toss Tosses its opponent forward. after grab after grab after grab after grab Spin Toss Spins to the back then tosses opponent behind it. after grab after grab after grab after grab Upwards Toss Tosses opponents upwards while on its vines. after grab after grab after grab after grab Ground Plant Slams the opponent into the ground. Body Spin Twirls around. This move can actually meteor smash around the hind legs. + + + + Vine Slap Slaps its vines forward. + + + + Rear Vine Spins its vines backwards. + + + + Spore Blast Blasts spores above it. + + + + Spore Smash Blasts spores below it. Can meteor smash but difficult to land. Bullet Seed Fires a hail of seeds directly upwards. Hold down the button to fire for longer. If this move misses, the opponent will have a big chance to punish you, but if it hits it can easily deal upwards of 20% damage. Depending on how fast your foe falls, you may be able to follow with an up smash. The mere existence of this move means experienced players will avoid attacking you from above, and new players will soon learn the same. + + + + Razor Leaf Throws a leaf directly in front of Ivysaur. The leaf has a random trajectory. Deals good damage and is easily spammable. Unlike other projectiles, Razor Leaf passes straight through people and destructible scenery. + + + + Vine Whip This is a Tether Recovery. Not very useful as an attack. However, can be used effectively as a means to prevent jumping back onto the stage, and when hit by the shock end of the attack the enemy can go flying back quite far. The end of the whip has a small "shock" to it. + + + + Pokémon Change Changes to Charizard. It shakes as its bulb spins. + ( or )+ or or It stands on its forelegs and dances. + It raises its vines and spins, saying "Ivy, ivy!" Charizard is a slow, heavy character with very strong attacks so use it to quickly polish off the perfect attack strategy. Charizard's front and side tilts are great and fast attacks. Side tilt has some knockback while up tilt can keep enemies in the air. Its front smash is very strong but also very slow, so the front tilt will be useful when there is not enough time for a smash. Charizard is also one of the three characters that can glide. However, it has bad startup for a glide, and it is kind of slow. Slash Combo Slashes two times then hits with its wings. + + + + Tail Swing Swings its tail forward. More knockback at the tip. + + + + Wing Attack Attacks upwards with its wings. + + + + Low Bite Bites while crouching. while dashing while dashing while dashing while dashing Awkward Kick Slides forward and kicks with one leg. Smash + + + (Smash + ) or (Smash + ) or Headbutt It rears his head back then swings his head at the opponent. Good for knock back but has considerable amount of lag. Smash + + + (Smash + ) or (Smash + ) or Wing Slash It waves his wings in the air hitting twice. Smash + + + (Smash + ) or (Smash + ) or Earthquake It hops in the air real quick and lands with a earth rumbling stomp. Does no damage to enemies in the air around you. Used for ground-based enemies only. after grab after grab after grab after grab Bite Bites the opponent. after grab after grab after grab after grab Jaw Toss Spins its opponent in its jaw then tosses them out. after grab after grab after grab after grab Quick Throw Throws its opponents behind it. after grab after grab after grab after grab Head Bash Sets opponent above it then slams with its head. after grab after grab after grab after grab Ember Sets opponent on the ground then burns him. Fire Spin Charizard spins in a ball. + + + + Flame Flare Shoots fire forwards. This move is amazing at edgeguarding. + + + + Rear Tackle Charizard hits behind it with its wing, claw and tail. + + + + Head Stab Stabs his head upwards. + + + + Charistomp Stomps downwards. during glide during glide during glide during glide Glide Spin Charizard spins forwards. Flamethrower Releases a stream of fire that does 2 damage per second, like Bowser's Fire Breath. However, the flame will wear out after a while. + + + + Rock Smash He picks up a boulder and shatters it with his head. The fragments are very powerful, but don't fly far. Can do upwards of at least 30% and has a super knockback capability. + + + + Fly Charizard flies up into the air, damaging anyone in his way. + + + + Pokémon Change Changes into Squirtle. It lifts its head and roars. + ( or )+ or or It turns to the camera and growls. + It stomps its feet. Triple Finish: When either Charizard, Ivysaur, or Squirtle take the Smash Ball, all three come out to fire heavy damage to the enemy. Charizard fires Fire Blast, Ivysaur fires Solarbeam, and Squirtle Hydro Pump. And, of course, it's super effective. The best way to use their final smash is to go to the edge of the stage and use it. This page was last edited on 15 October 2012, at 10:41. This page has been accessed 51,165 times.